Paris Restaurants and Beyond: Chalet du Parc - When In France . . .
Chalet du Parc - When In France . . .
Well, it's summer--at least going by the calendar, not by the July autumnal weather--and when one lives in France, one is obliged to take at least one leisurely Sunday afternoon lunching in the country at a quaint, over-priced chalet-like restaurant near a park, then go home and paint some sunflowers or elegantly appointed country dancers and exercise to burn off all those calories you acquired during the 4-hour, multi-course lunch. So, clearly up for our national duty on what may have been the only truly sunny, temperate day in the past two months, Mortstiff and Co. took the car out of mothballs a few weekends ago, and drove approximately 30 kilometers southeast to the quaint, over-priced chalet-like restaurant near a park called, aptly enough, Chalet du Parc, located in peaceful Yerres. That it's taken me this long to write up my review suggests something about our experience. Ambience and atmosphere get high grades, but the albeit creative cooking of chef Philippe Detourbe left us somewhat unimpressed. More fairly, it was pretty good, but not especially memorable. Nonetheless, I actually took some decent photos this time, thanks to the sun, and I don't want to let the opportunity to share them fall through the cracks. Without the photos, however, I know I wouldn't have remembered a single dish if not for the carte cheat sheet. There you have it. Along with a 28€ St Nicolas de Bourgueil and two expressos, the lunch totalled 126€, rather pricy for a leisurely Sunday lunch in the Parisian countryside, but you get the sun (if you're lucky), the park, the little galerie just caddy-corner to the chalet, and some nice photos. It could be worse. Note: Philippe Detourbe runs another restaurant in Paris, L'Ampere, 1 rue Ampere, 75017 Paris (tel. 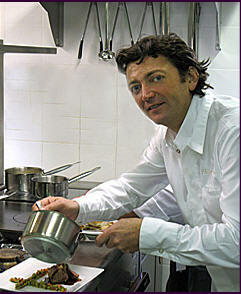 01 47 63 72 05) and gives cooking classes, all detailed at his website, www.philippedetourbe.fr. Let us know what you find out if you try them.